This mother has had about every birth situation imaginable! I loved reading her stories and her thoughts and I hope you do too. Birth is beautiful, but it isn't always what we expect. Enjoy! First Baby = Typical Hospital Birth (Epidural/episiotomy/etc etc etc) It was my learning experience. I knew birth could be better. I didn't like how I was treated or how my baby was treated. Third Baby = My first waterbirth at home! Sixth Baby = Another awesome HBAC waterbirth. -What made you desire a VBAC when they seem so hard to come by in the current obstetric climate? VBAC was something I already believed in prior to my c-section, but after having my own cesarean (something I never thought would happen to me), I had to look into the risks/benefits much more closely. I had to consider possibilities I never imagined I'd have to think about. After having looked at the research more extensively, VBAC still seemed like the healthier choice for my baby and myself. -How did you find a care provider who would support you? I joined (and helped to form) our local ICAN chapter and got plugged into our local birth network and learned all the birthing options. I learned a LOT about all the local providers. The choice became very clear. -What was labor like for you? Surprisingly long. But pleasantly peaceful. Having accurate information, the right support, the right environment, and the knowledge that my body could do this. I'm a very blessed girl to have such incredible family and friends supporting me. I attended an ICAN conference which was extremely helpful in almost every way imaginable. I did the Hypnobabies home study course and attended all of our local ICAN meetings. I'm a co-leader of our chapter. It was healing after the trauma and disappointment of my emergency cesarean. My first VBAC birth story is here. My second VBAC birth story is here. 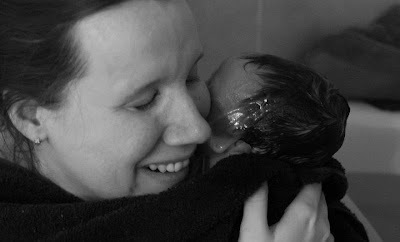 The postpartum experience after my first VBAC was beautiful. It was the first birth after which I had no tearing. I felt terrific almost right away and recovery was a breeze compared to the major abdominal surgery I had experienced before. She is such an important resource in our community, too! I know she's helped a lot of mamas get the birth they want with her wealth of knowledge and sharing her stories!